Betty (played by Allison Janney), was one of my favorite character's in The Way Way Back. Betty's behavior is pretty outrageous. She's a little off the wall, but at the heart of her character, you can see that she just wants the best for her kids. It's refreshing, because she's very upfront about everything that she does and she doesn't mince words. I recently had the chance to interview Allison Janney (Betty). The first question I asked Ms. Janney, was if she had a favorite part in particular about playing the character of Betty, in The Way Way Back. "I think it's just her boundary-less behavior and her brazenness. I wanted to strike that balance especially with River, who played Peter, my son. I say some pretty shocking, awful things to him. And my goal , the challenge for me there, was to be able to say that and yet have the audience know how much I love my son and I'm just trying to give him some tough love. So, I got to do that with some physical things and some adlibs that they let me know in at the end of the scenes. It was important to me that you see that she really loved him. It's all very practical and she just wants him to have some skin, maybe the skin that she doesn't have or she didn't have. To be tough and to be able to deal with life and all of the ups and downs that are going to come his way, because of his eye. I loved that part of Betty, finding that balance" said Allison Janney. There were so many pivotal transitions in the storyline of The Way Way Back. I really love that the most unlikely individual, Owen, becomes a shepherd for Duncan and the kids at the water park. I was interested to see if Ms. Janney also had a favorite part in the storyline of this film. "I think definitely the relationship between Owen and Liam's character, between Sam and Liam, when Liam admits to him that his mother's boyfriend calls him a three and undervalues him as a person, and when Sam Rockwell's character tells him that he's not. And he knows. It was a lovely, beautiful moment and that he felt comfortable to share that awful secret with him, I thought that was a big moment. It was beautiful" said Allison Janney. The comedic, yet moving storyline of The Way, Way Back captures all of the intricacies and at times, harsh realities of life. From the awkward [let's face it - sometimes - downright cringe-worthy] moments of the teenage years - to the scary unexpected transitions that we can encounter as adults -it's all there. The Way, Way Back offers up a highly relatable storyline - with plenty of laughs to be had throughout. Definitely add this one to your list of must-see movies this Summer! From the studio that brought you 500 Days of Summer, Juno and Little Miss Sunshine comes the indie family comedy of the summer! 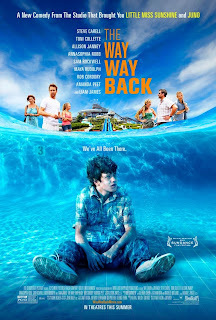 THE WAY, WAY BACK is written and directed by Nat Faxon and Jim Rash (co-writers of The Descendants) and stars an amazing ensemble cast including Steve Carell, Toni Collette, Allison Janney, AnnaSophia Robb, Sam Rockwell, Maya Rudolph and Liam James, Amanda Peet and Rob Corddry.